Humans and our pets share the classic symptoms of diabetes: extreme thirst, increased urination, fatigue, and weight loss. Part of the problem when our pets get sick is that they can’t tell us if they experience these symptoms—we have to be paying attention! We can’t be effective lookouts if we don’t know what we’re keeping watch for. In honor of World Diabetes Day, held on November 14, we’re going to tell you about diabetes, discuss causes and risk factors, and share tips for caring for a pet with diabetes. There are multiple kinds of diabetes but there are two main types that are referred to simply as Type 1 and Type 2. When an individual has Type 1 Diabetes, they are unable to produce insulin. Essentially, that individual has an insulin deficiency. For dogs this is the most common type. On the other hand, when an individual has Type 2 Diabetes they have no problem producing insulin but their body has trouble using it. In other words, the individual has insulin resistance, which is more common for cats. In both types the blood sugar begins to run high because the energy from food is inaccessible without insulin or the body’s ability to use it. It’s imperative to understand that while a healthy diet and exercise is important for pets with Type 1, just as they are for everyone else, the disease itself cannot be managed with diet and exercise while with Type 2 that’s the first line of defense! When your pet first falls ill, the symptoms they experience (see above) are the same so you’ll need to bring your pet into your veterinarian, not just to confirm the diagnosis of diabetes, but to confirm which type your pet has. Caring for your diabetic pet looks a little different depending on which type your pet has. 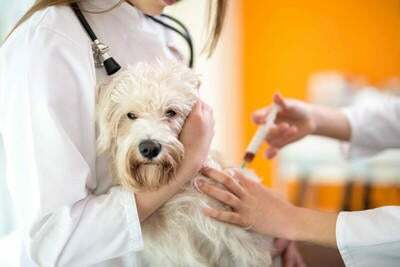 Furry family members with Type 1 require insulin injections, although some with Type 2 also need injections. Those with Type 2 also need special attention paid to their diet and exercise levels. Pets with Type 2 may also need to have their food adjusted, whether in terms of quantity, quality, or both. They’ll also require increased exercise, whether that means you play with your cat more frequently or you enroll your canine companion in Doggie Day Camp! Unfortunately, diabetes can be dangerous when blood sugars get too high or too low. Consistently high blood sugars (hyperglycemia) can lead to numerous complications such as impaired eyesight, kidney failure, and even death. Blood sugars that are too low (hypoglycemia) are more urgent in the short term and require that you treat them with glucose immediately. To keep track of your pet’s blood sugar numbers, you’ll want to keep a glucometer handy. It’s important to test your pet’s blood sugar before mealtime and anytime your pet exhibits strange behavior because that could be a sign of high or low blood sugars. While diabetes is a manageable disease, type 1 is sadly not curable. Nonetheless, with your love and care your pet can still live a full and happy life with either type of diabetes! If you have any suspicion that your pet may have diabetes or would like to see NOVA Pets staff regarding daily care for a pet that you already know has diabetes, schedule a checkup right away. You may schedule an appointment by calling (703) 378-9791.